I just read about suicide in the entries last night and so glad you shared on this film ! It is a very caring way to point out there are those who try to help severely bullied and depressed young people try to convince them not to commit suicide . We can not always win though and that is because of the minds power to still override efforts to direct it in a positive way back to trusting life again. Bullying is so horrible in its consequences because words can hold power to destroy a persons heart and damage their soul and leads to despondency. That sets up the stage for suicide strongly in some very vulnerable hurting people. Few movies have been made about radio DJ Tony but they’ve all been really good. Remember Play Misty For Me? Good old Clint Eastwood…great subject for a movie. Why do I feel like I’ve seen this movie? 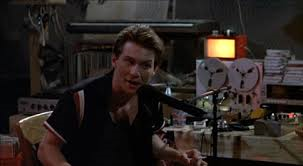 I like I Christian Slater, thought he would’ve had a bigger career, the kid had a fantastic persona, but I guess he never got the right movie to propel him to superstardom. I listen to a fair bit of sports talk radio and respect the ability these guys have to hold an audience for 3 hours or more; projecting a personality with just the use of a voice is not easy. Larry King I’ve been told was the best. Another guy is George O. could never remember his last name, but his show is all about space aliens and emember when shock radio was in vogue…how can we forget Howard Stern?